Not to be confused with Challenge Mode. 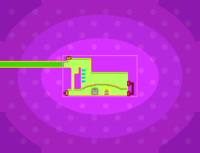 The Challenge Node is an area found inside Bowser's body in Mario & Luigi: Bowser's Inside Story and its 3DS remake, Mario & Luigi: Bowser's Inside Story + Bowser Jr.'s Journey. It is, apparently, located in Bowser's spleen. This area is completely optional and does not need to be entered to complete the game. 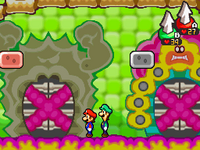 It is one of the first areas available to Mario and Luigi in Bowser's body after they clear Trash Pit. The first time Mario and Luigi enter the area, and when a new challenge becomes available, the bros. will be greeted and talked to by an Emoglobin. Its icon on the map of Bowser's body looks like an opened Nintendo DS with two dots of eyes on the top screen and one of mouth in the bottom, which the Emoglobins in the area also resemble. The Gauntlet - Here, the Mario brothers can fight X Bosses, which are optional bosses that are similar to bosses they have fought before, but more tough. One of these bosses, Bowser X, is the toughest boss in the game. In the remake, giant battles can be re-fought here at a faster-paced difficulty. Cholesteroad - Here, Mario and Luigi use the Special Attacks they have learned to fight the same enemies until the player messes up. There is also a block that works the same way a Rally Block does here. If it is hit 99 times in a row, the player can double their Coins whenever they want, but only once. This page was last edited on April 16, 2019, at 09:49.